Our device determines the health of the embryo by monitoring the metabolism of the embryo. In order to monitor the metabolism, we will measure the autofluorescence of NADH present in the cell. NADH is an important biomolecule involved in the cell’s production of energy, and when laser light illuminates the embryo, NADH will autofluoresce, or emit its own light. Our device is then able to measure what is called the lifetime of NADH, or the time delay between the laser light and the autofluorescence. This process is known as Fluorescence Lifetime Imaging Microscopy (FLIM), and by analyzing the FLIM signals, it is possible to analyze the metabolic information of the embryo. This data provides a unique signature that is reflective of the health of the embryo. Utilizing this signature, our device will then refer to a reference embryo viability library to determine the embryo’s health and probability of conception when implanted. The schematic above illustrates the overall procedure of our product. As mentioned previously, the embryo will first be illuminated with blue light. Next, the biomolecule will autofluoresce and a photodetector will collect the emitted light. 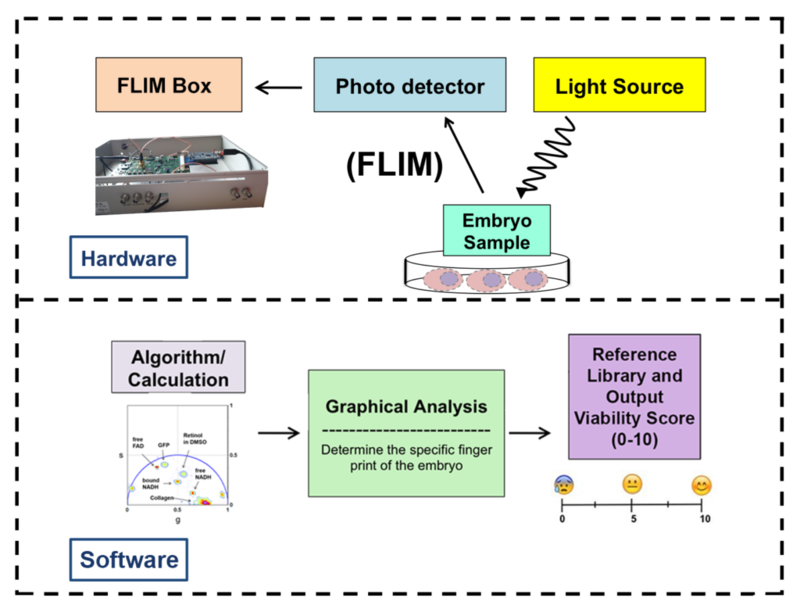 In order to analyze the emitted light and compute the embryo’s metabolic signature, the data collected will be passed along to a field-programmable gate array (FPGA) chip contained within the FLIM Box. This chip represents an integral component of our product as its main advantage is parallelism, which is needed to quickly calculate the metabolic signature. Therefore, the FPGA chip will assist in processing the data through our algorithm, ultimately resulting in a phasor plot. Through the phasor plot, the signature is given a graphical representation in which our product will reference to a reference library. Finally, after cross-referencing the signature to the library, our product will provide the clinicians with a final viable or non-viable result.